This was a spectacular end to a home stand unlike any in recent memory. The Bulls scored 68 runs to their opponent’s 38 over the 8 games. 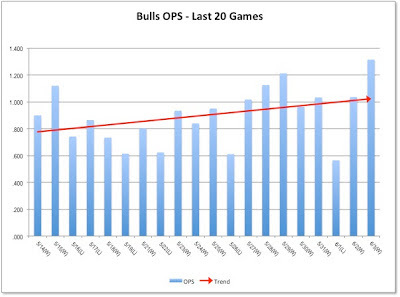 Monday’s game was the most lopsided with the Bulls runs coming off of 16 hits, 9 walks, and a hit batsman. The hits included 5 doubles, a triple, and 2 home runs, which added up to a stunning team OPS of 1.314, the best game of the season. The anorexic (6’2“, 140 lbs) Rail Rider starter, Kelvin Perez , only lasted 1⅓ innings and was charged with 6 of the Bulls runs. He left the game alleging something wrong with his pitching arm, which seems entirely plausible. Every Bull got at least one hit. Only Mike Fontenot and Tim Beckham didn’t get RBI, but they scored 3 (Fontenot) and 2 (Beckham) runs. If you have to pick out particularly outstanding performances, Jason Bourgeois’ 5 hit day (3 singles, 1 HR, 3 runs scored, 2 RBI) is up there. As is Rich Thompson’s double, 3 RBI triple, 4 RBIs and 3 runs scored; not to mention a spectacular catch in the bottom of the 2nd inning to kill a rally by the RRs. Matt Buschmann’s first start was OK, but he didn’t last long enough to get the win. Will Inman left the game with an injury. Here’s hoping that it isn’t serious. Jeff Beliveau got the win. That should be at least some modest compensation for what must have been two extremely frustrating trips to and from the Rays in which he never got to throw a pitch. Maybe next time. Former Bull Ryan Reid was just called up to the Pittsburg Pirates, so he won’t be seen in Indianapolis. Probably a good thing. His ERA in 20 games and 34 innings this year is a stellar 0.52. Reid appeared in 46 games and pitched 80 innings for the Bulls last year. One of the Bulls' bullpen stalwarts. This will be his first big league call up. He came up through the Rays system. Did the Rays let a talent get away from them? 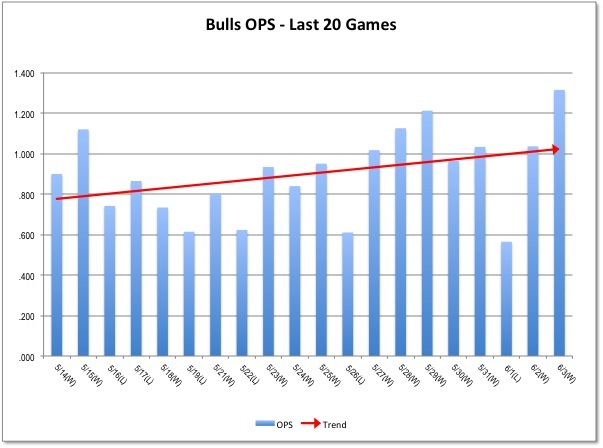 Have to put up this OPS chart. We probably won’t see its like again.